Rock icon Ronnie James Dio is about to tour the world, in the form of a hologram, with the band Dio's Disciples. Dio died in 2010 from stomach cancer and his widow, Wendy, has worked with the hologram company Eyellusion using footage from his Sacred Heart and Dream Evil tours. Ronnie was always wanting to experiment with new stage ideas and was a big Disney fan. With this aid, I am sure he is giving us his blessing with this hologram project. It gives the fans that saw Ronnie perform an opportunity to see him again and new fans that never got to see him a chance to see him for the first time. We hope everyone will enjoy the show that we have all worked so hard to put together. 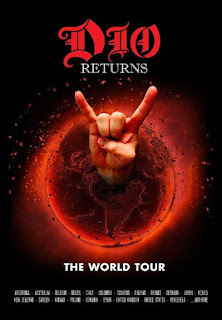 Along with footage from those tours, they are also using live audio from a number of parts of Dio's career along with a live performance by Dio's Disciples. The current members of the band include Craig Goldy (Dio), Simon Wright (AC/DC, Dio), Scott Warren (Heaven & Hell, Dio) and Bjorn Englen (Soul Sign, Yngwie Malmsteen). It's not known how vocalists Oni Logan, Mark Boals and Tim "Ripper" Owens will fit into the project. Let's hope that the little guy with the red fork has given his stamp of approval. As he once said to Bart Simpson, "And don't forget:Listen to Heavy Metal Music!"